Kelly has been a practicing attorney since 1992 and is a graduate of Loyola University of Chicago School of Law (Juris Doctor 1992; Master of Laws (LLM) in Tax Law 2017). 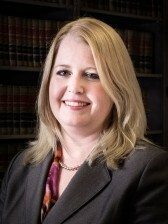 She is a founding partner of Schlack & McGinnity, P.C. and was an associate and principal of its predecessor law firm, Haddad, Schlack & Associates. Kelly is admitted to practice before the Illinois Supreme Court (1992) and the United States District Court for the Northern District of Illinois (1992). Kelly concentrates her practice in the areas of Federal and State Tax Settlements including Offers in Compromise, Installment Agreements, Collection Due Process Hearings, Protests, Hearings and Board of Appeals Petitions; Estate & Trust matters including contested and uncontested Probate administration, drafting Wills, Trusts, Living Wills, Powers of Attorney for Health Care and Property and preparing and filing estate & gift tax returns. Kelly was born in Wisconsin and has lived in Chicago since 1989. She has two adult daughters.